What should you watch out for when using bimetal thermometers? The bimetal thermometer is an on-site measuring instrument suitable for measuring medium and low temperatures and can directly measure gas. The following is a detailed introduction. 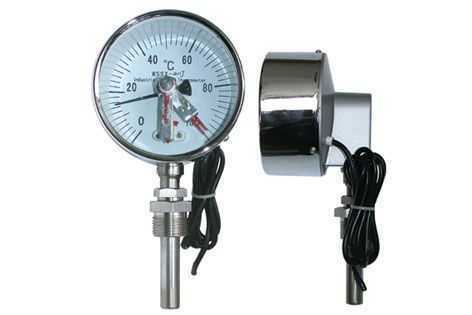 1, bimetal thermometer protection tube immersed in the measured medium length must be greater than the length of the temperature sensing element, generally immersed in length greater than 100mm, 0-50 Â°C range immersion length greater than 150mm, in order to ensure the accuracy of the measurement. 2. All kinds of bimetal thermometers should not be used to measure the temperature of the medium in open containers. Charged junction thermometers are used in control loops where the working vibration is greater than the wing. 3. In the storage, use, installation and transportation of bimetal thermometers, collision protection tubes should be avoided. Do not bend the protection tube and use it as a wrench. 4, the thermometer should be tested regularly under normal use. It is generally appropriate every six months. Electrical contact thermometers are not allowed to work under strong vibrations so as not to affect the reliability of the contacts.